This musical saw Betty Grable bring down the curtain on a career in which she had been everything the title said. But the 38-year-old star is soundly upstaged in her swan song by Sheree North, a blond bombshell 16 years her junior and making only her fourth feature. Bearing a passing resemblance to both the earlier She Loves Me Not and the later Some Like It Hot, the film gave writer/producer/director Nunnally Johnson the excuse to keep his stars in the skimpiest of costumes. Not even that old scene stealer Charles Coburn could come out on top with that sort of competition. 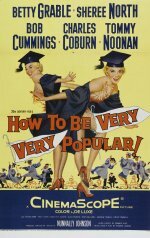 Musical comedy starring Betty Grable and Sheree North. Two exotic dancers, forced to flee after witnessing a murder, are given refuge by a group of college boys.